Here you take enjoy live video from a camera at Haneda Airport International Terminal Station. Live Camera*Please understand that maintenance and other issues may prevent viewing. 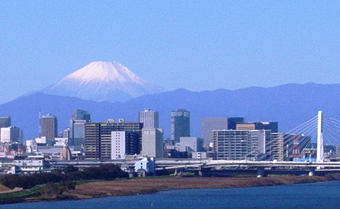 On clear days, especially in winter, you can see Mount Fuji from the live camera. 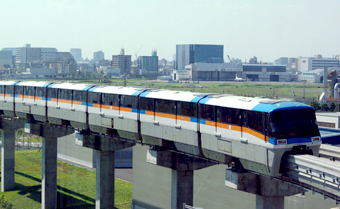 Enjoy watching the monorail move in real time between Haneda Airport International Terminal Station and Tenkubashi Station. *Please understand that maintenance and other issues may prevent viewing. If a message starting with "To help protect your security" appears under your address bar, click the message, then click "Allow Blocked Content." When the "Are you sure you want to let this file run active content?" message appears, click "Yes." 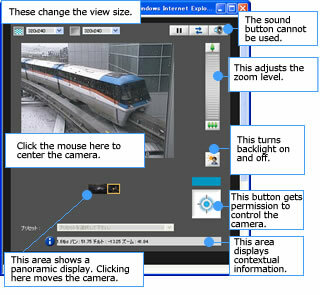 Click the "Obtain control permission" button to get permission to operate the camera. Once you have permission, the camera control indicator will become blue, and the number of seconds you have to control the camera will appear. Click a point in the camera's field of view to center the camera on that point. You can also use preset buttons and the zoom bar to adjust the camera further.